When I heard the news that Buddy Cianci — serial felon, wearer of atrocious toupees, revered and reviled former mayor of Providence, R.I. — had died on Jan. 28 at the age of 74, my first thought was not about death. It was about my birth as a writer. In May of 1976, a free Providence weekly called Fresh Fruit published my interview with Cianci, then the city’s brash young Republican mayor. Forty years later, I still own a crumbling clip of that interview. Maybe that’s not surprising since that clip is the first piece of writing I ever published, the first time I saw my byline in print. It’s my birth certificate. Writers tend to cherish such things. When I interviewed him, Cianci had been in office for 16 months and I was one month away from my college graduation. More to the point, I was on a caffeine- and amphetamine-fueled binge to finish writing the final chapters of a history of the city of Providence, an independent-study project I’d been working on for two years because I’d become intoxicated by the city’s crazy quilt of ethnic neighborhoods, its fluorescent Mob presence, its post-industrial ruins, its wobbly triple-deckers and Greek Revival gems, its scuzzy waterfront, the milky fogs that spilled in off Narragansett Bay, the overall sense that this was a once-mighty shipping and manufacturing center the best times of which were long past. The place felt forgotten. The Wall Street Journal dismissed Providence as “a smudge beside the fast lane to Cape Cod.” That’s precisely what I loved about the place: it was the un-Boston, with little of the conventional New England charm. And it was a prolific incubator of criminals. Jimmy Breslin might have had Buddy Cianci in mind when he said, “Providence is where the best thieves come from.” What better way to end my elegiac history of this faded old city than by interviewing its optimistic, forward-looking young mayor? For as far back as anyone could remember, politics in Providence had been controlled by a Democratic machine that ran on the grease of patronage — payoffs, kickbacks, bribes, no-show jobs, rigged contracts and other niceties. Cianci, a political novice, had come out of nowhere to stun the Democratic incumbent, a booze-marinated Irish ward heeler named Joe Doorley. Well, not quite nowhere. Cianci, the city’s first Italian-American mayor, had come up through the attorney general’s anti-corruption task force, where he made a specialty of going after Mob families. Providence was a target-rich environment in those days. After a murder conviction in 1970, Raymond Loreda Salvatore Patriarca, Sr., head of the New England Mob, had relocated his headquarters from Providence’s heavily Italian Federal Hill neighborhood to his cell in the federal penitentiary in Atlanta. Business remained brisk. 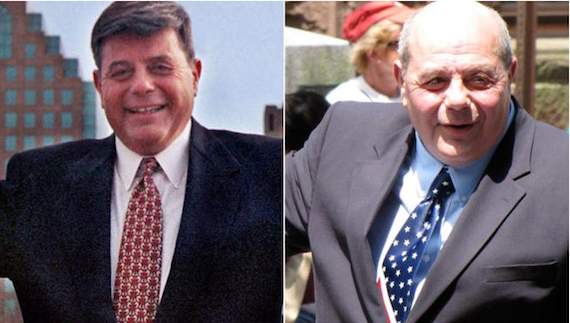 In due time Cianci’s power would become far more absolute than Joe Doorley’s had ever been. A few months after he granted me an audience in City Hall, Cianci gave an electrifying speech at the Republican national convention. Overnight he became a GOP darling, proof that the party was still relevant in the cities of the Northeast, and there was talk of Cianci as a vice presidential candidate, maybe in a cabinet post, or a senate seat. His potential seemed boundless. Using his charm, energy, and ruthless political skills, Cianci won re-election as mayor in 1978 and again in 1982. I’d left Providence shortly after my college graduation, but I always kept an ear cocked for news about the city, which usually amounted to news about Cianci — or the latest perp walk by one of his minions. As Cianci’s power grew, the FBI’s interest in corruption inside City Hall grew along with it. During Cianci’s first tenure as mayor, 22 city workers were convicted on corruption charges. But the FBI couldn’t lay a glove on Buddy Cianci. Only Buddy Cianci could do that. In 1983 Cianci got himself involved in a little dustup that would have shocked even world-wise Lord Acton. One night the mayor summoned a wealthy contractor named Raymond DeLeo to his home and, as a city cop and two other men looked on, Cianci accused DeLeo of having an affair with his estranged wife. Cianci then proceeded to spend three hours assaulting DeLeo with a versatile arsenal that included fists, feet, saliva, an ashtray, a lit cigarette and a fireplace log. It was like a game of Clue for Sociopaths: the Mayor did it in the Living Room with the Lit Cigarette and the Fireplace Log. Cianci pleaded no contest to the assault and kidnapping charges and resigned as mayor. He received a five-year suspended sentence and spent the time hosting a popular radio talk show, keeping his name in the air, waiting for his chance. Eligible to run again in 1990, he was re-elected by 317 votes. Only in Providence, I thought, when I heard the news about Cianci’s astonishing comeback. The attitude of voters seemed to be Hey, DeLeo was screwing the guy’s wife. He had it coming. Besides, Buddy was a great mayor. Now Cianci’s power became absolutely absolute. The mayor clearly loved his city, and his city loved him back. He produced a pasta sauce, Mayor’s Own Marinara Sauce, and donated the proceeds to a scholarship fund. He was everywhere, attending Little League games, banquets, business openings. It was said he would attend the opening of an envelope. He became a wise-cracking regular on the “Imus in the Morning” radio show. There was no denying that he was doing a spectacular job of rebuilding the city’s downtown and burnishing its faded image, but he was also turning City Hall into what one judge would call “a criminal enterprise,” a place where envelopes of cash changed hands as people paid bribes to buy city jobs, contracts, reduced tax bills, or city land. Cianci made Joe Doorley and his Democratic lords look like a bunch of schoolboys. Unfortunately, the FBI was still on the case. In 2001 Cianci was indicted by a federal grand jury on racketeering, conspiracy, extortion, witness tampering and mail fraud in the FBI’s so-called Plunder Dome investigation. In June of 2002 Cianci was found guilty on one count of racketeering and acquitted of 11 other corruption charges. While he was awaiting sentencing that summer, I got it into my head that his rollercoaster career would make an interesting magazine article, maybe even a book. So I took an exploratory trip back to Providence, where I witnessed the weekly WaterFire spectacle downtown — bonfires on the river set to New Age music — and I was astonished to see that in the past quarter-century downtown had been transformed, almost miraculously, from a ghost town into a vibrant hub of activity. I read newspaper microfilm in the downtown library and roamed the city, compiling a tidy little stack of Cianci’s achievements and misdemeanors, plus a sense that beyond the shiny new downtown, the city hadn’t changed all that much. The industrial ruins were still there, the triple-deckers still wobbled, the public schools were worse than ever. The city struck me as a miniature version of Baltimore: a shiny veneer doing its best to conceal a lot of rot. In September, Cianci was sentenced to five years in prison. At the sentencing, U.S. District Judge Ernest Torres said, “I’m struck by the parallels between this case and the classic story of Dr. Jekyll and Mr. Hyde. There appear to be two very different Buddy Ciancis.” In 2003 a Providence Journal reporter named Mike Stanton published a richly reported book on Cianci, The Prince of Providence, which became a bestseller. My own book project died aborning. After serving his five years at the federal prison in Fort Dix, N.J., Cianci emerged immaculately bald, shorn of the squirrel. “I took my medicine,” he told The New York Times. “I took it like a man.” Then he went back on the radio airwaves, wrote an autobiography called Politics and Pasta, and got busy plotting yet another comeback. For all the many things he did in life, both good and bad, it’s hard not see Buddy Cianci as a gifted politician who missed a shot at greatness. His seemingly boundless early potential never led to much. For all the loyalty he inspired in the citizens of Providence, his peculiar style — the squirrel, the marinara sauce, the one-liners, the stubborn whiff of corruption — did not travel well beyond the city limits. He ran for governor of Rhode Island in 1980 and was beaten badly by the incumbent Democrat, J. Joseph Garrahy. Cianci considered a run for U.S. Rep. Patrick Kennedy’s seat in 2010, but decided against it. Then in 2014, after a bout with cancer, Cianci made one last run for his old job at City Hall. It turned out that even the voters of Providence do not possess a bottomless reservoir of forbearance. In the 2014 mayoral election, Cianci lost to Jorge Elorza, the current mayor, who ordered the flags at City Hall flown at half-staff when the word spread of Cianci’s death. Mike Stanton, the former Providence Journal reporter who wrote the book on Cianci, said the man “embodied the best and worst of American politics.” True, as far as it goes, but I can’t help thinking that American politics is a little bit poorer — and drabber — without the fluorescent presence of people like Buddy Cianci, a skillful politician, a man who loved his city, a Jekyll & Hyde figure who forgot the lessons Lord Acton had tried to teach him. We used to have vivid, inspiring, maddening politicians like Huey Long and Franklin Delano Roosevelt and Lyndon Johnson and Coleman Young and Buddy Cianci. Nowadays, what passes for colorful is that bad dye job called Donald Trump. The obituarist who came closest to the truth about Buddy Cianci was Dan Barry. Writing in The New York Times, Barry called Cianci “a walking coulda-been.” Perfect. Absolutely perfect. Oliver’s queer identity and search for meaning provided the subtle underpinning for much of her work and we—in search of understanding, comfort, fortitude—often saw ourselves and our questions reflected in it. Yesterday it was learned that Pulitzer Prize winning author Carol Shields passed away. She was best known for the book that won her the prize, The Stone Diaries. They broadcast an old interview with her on NPR yesterday, and Shields talked about how she squeezed in an hour of writing each day between teaching and taking care of her young children and after nine months she had written The Stone Diaries. Her last book, Unless, didn’t recieve a huge amount of press, but it sold tremendously well at my bookstore and was much loved by the readers I spoke to about it. If you want to learn more about her, here is her obit in the New York Times. Roger Ebert was a movie man. All over the internet, he is being remembered for his love for movies, for the enthusiasm he brought to film, and for elevating it to its rightful place as art. All well-deserved. But as much as he “belongs” to film, so too does he belong to us writers. We ought to consider him one of our own, rather than thinking of him as a pop icon, denizen of another, separate world. The outpouring of affection shows how beloved he was by writers. The cause is obvious: Ebert cared intensely about writing, and more than many of us, he brought his best self to it. He was “reluctant to write in a hurtful way” — unless it was to trash a movie that he felt was cruel in spirit, or that insulted its audience. He helped other writers, too, extending his hand to young upstarts and secretly sponsoring other Chicago journalists who joined AA. Say what you will about his taste in movies or his willingness to embrace “trash” (even in a “silly” film, he wrote, “you will find something profound” about “what people desire and fear”). No writer can help but find it humbling and awe-inspiring to know that a man who lost the ability to eat, to drink, and to speak somehow managed to keep writing. I doubt many people could do that. I’m barely able to muster the heart to write after I’ve eaten a burrito. Just holding on to the will to live in Ebert’s state would be too great a challenge for most, but he wrote and wrote: about movies, politics, atheism and faith, alcoholism, everything else in life, and death. He wrote through a debilitating illness, through surgeries and years of hospital care. That is bravery, in my book. Doing something for love — of movies, of writing, of his fans — in the face of death is bravery. We writers ought to embrace him for it. The rest of us can only hope that, if we are held on the precipice as long as he was, we are visited by some portion of his courage. It occurs to me that I’m judging Holden more like an old friend than a character in a novel. This is perhaps the largest compliment I can pay him, and Salinger, too. Love this, Bill! I lived in Providence for many years and met Buddy just once — before his second felony while I was working for an environmental nonprofit — at an event at some ballroom in the Biltmore. He was holding court, smoking cigarettes despite state law, and generally being Buddy. My boss introduced me and a few colleagues, who happened to be attractive, 20-something women. Buddy looked right through me, eagerly chatted up my colleagues, and put his cigarette out in a tea cup. All in all, it was pretty great. Well done. As my old roommate from Providence said: “They broke the mold when they made him.” There’s a reason clichés are useful– for certain situations and certain individuals, they are dead-on. This seemed to be Leonard’s way. He transformed the world into his image of it. Those of us who were around were brought into a land of ancient poetic lore. It seems worthy of a Twilight Zone episode: Richard Matheson. 87. A writer and screenwriter and noted figure in the annals of contemporary literature. He’s about to find out, though, that simply producing an effective story is not enough. When adaptations are concerned, sometimes, an effective story is just what one needs to produce a completely ridiculous and terrible story. Richard Matheson is entering a world beyond sight and sound. He’s about to arrive…in The Twilight Zone.